First and foremost, the staff at Norma's strives to provide a safe and loving environment for the children entrusted to our care. We know how hard it is leave your child with anyone, and try our best to create the community and level of care that lets you do so with confidence. Your child will become part of our NKP family, where the children develop friendships with each other, and relationships with our staff. It's important for all children to become life-long learners, and the building blocks of that goal start in their early years. We believe strongly in a "learn through play" philosophy, where children naturally acquire skills and knowledge they need, while having fun playing with peers, and through exploring their world around them. We'll set things in motion by providing a rich array of opportunities to develop all aspects of a well-balanced, growing child. By having a range of children from infants to pre-Kindergarten, all of the children benefit. The younger ones watch and learn from the older ones, and mimic their play and actions. The older ones learn to be gentle "leaders", and those who are close in age share developmental stages and grow together, from walking and talking, imaginative play, physical play such as running and bike-riding, dancing and dress-up to quietly looking at books together. The other plus is that siblings can attend together. As we like to say, it's "the next best thing to home". We believe in the children developing self-help skills and teaching them to be independent. This includes feeding and dressing themselves, going to the bathroom and washing up by themselves, learning to "pump their legs" when they are on the swing, and helping to clean up the toys. Each child is so proud as they accomplish tasks and do things on their own. Another goal of ours is to help each child develop social skills and critical thinking that are predictors of future success in school and in life. 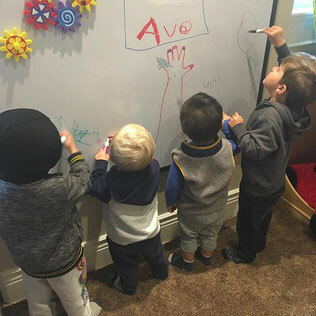 Learning to get along with their peers, taking turns and sharing, having good manners and following directions are all things that we stirve to teach the children. We try to teach the children to make decisions for themselves when possible, and to learn the natural lesson of consequences, and cause-and-effect relationships. 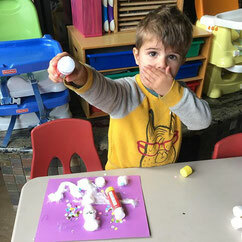 We believe in creative expression, both through play and arts and crafts. 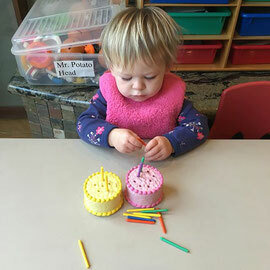 There is an abundant supply of craft materials we use, both in directed activities and in "free art". We provide lots of fun dress-up and role-playing toys, and have a play "store" and "kitchen". The children all love to play with the baby dolls and books. We also provide pre-math and early science toys such as puzzles, counters, binoculars, child's tape measures, magnifying glasses, etc. 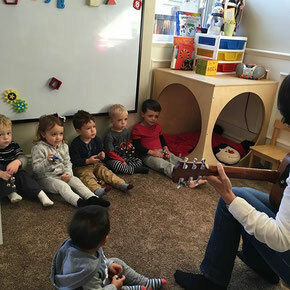 Music and movement is important too, so we provide musical toys, and we get up and dance and sing! We also rotate many items, to keep them "fresh" for the children. We create our own monthly calendar, with fun "themes" for the children, and with certain planned activities listed. The children love to see what they'll be doing that day, and it gives the staff a topic or theme to work a variety of activities around. 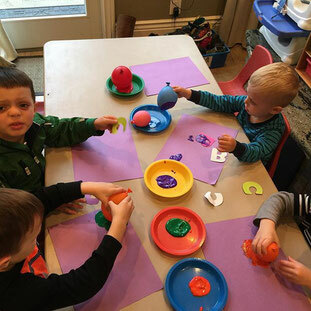 We strive to keep developmentally appropriate goals and practices in mind for the different age-groups, and differentiate and extend activities as needed for each child.